Pink packaging beauty products never fail to fascinate me. I might as well swear that I love beauty products that have cute design on its packaging. 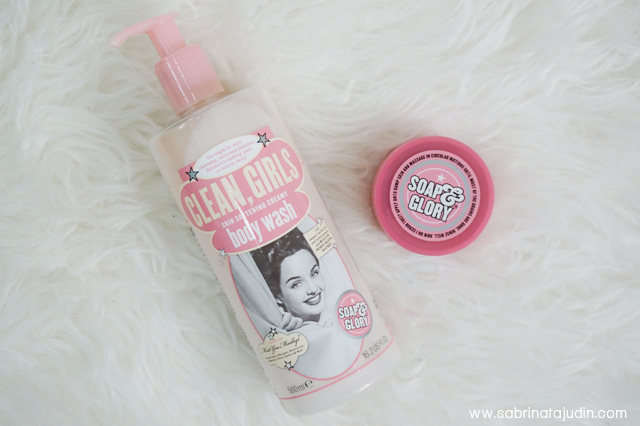 One of the reason I ran into the obsession of these Soap & Glory products. I knew about this products when I was strolling around Sephora Malaysia. I ran into the Soap & Glory section because I saw a whole range of products in pink packaging with vintage women picture on it. How cute is that! Looking at the price tag, it was pretty good to me. Range between RM19.00 - below RM100. I took the chance when I was at the Sephora Black Card launch event to grab some of Soap & Glory products. So here are my pick up for the Soap & Glory products. I bought the Soap & Glory Clean, Girls Skin Softening Body Wash & the Flake Away Scrub. It took me a week to open the body wash because I was a bit too sayang to open it. It look so cute on my vanity. Oh my what am I babbling about now. The Soap & Glory Body Wash in Clean Me comes in a pretty big pump bottle. I use it during my night shower. The only thing that bothers me is that I need at least 8-10 pumps for a one time shower routine. Pretty much right. I don't want this body wash to run out fast. The texture of this body wash is creamy. It has a milk sweet and fresh scent to it. Not too overpowering. Describe as a body wash that contains natural vanilla fruit and orchid extracts plus a built-in moisturizing matrix. It is a pretty good body wash that leaves my skin smooth and clean. I feel so relaxed after that and its the perfect feeling to go to bed after a long hours of work! It is priced at RM29.00 for a 500ml pump bottle. Pretty nice right. The second product that I pick up from this brand is the Flake Away Body Polish in travel size (50ml). Priced at RM19.00. Describe as a scrub that contains shea butter, sweet almond oil, peach seed powder, sea salt and sugar. It is mainly recommend to be use for you feet and other parts of your legs. This body polish has a fine and packed gritty texture that I find cool. It is not gooey in a way that it is hard to handle while showing. Easy to hold and apply on your skin. The texture is just perfect! It helps to give me that "scrubbing" feeling. A little goes a long way, you need about a scoop of the size of your two fingers. It leaves my skin feel fresh and clean! Sometime the sweet scent can be overwhelming, but so far I am loving it! Sometime scrubs can makes your skin turn really red, but this doesn't really makes your skin look too red if you know what I mean. Overall I am loving my Soap & Glory purchase! Look forward to try more. You can purchase Soap & Glory products at any Sephora outlets and I heard Zalora also carries Soap & Glory products now. What Soap & Glory products you have tried and would recommend me to try? Let me know in the comment section below! oh, Sab! You're gonna turn me into a fan! You mentioned you're a big fan of Benefit before so I checked it out and I have to say, it's awesome! Now... these babies! Ugh! I love anything vanilla!! I'm gonna check these out and definitely gonna get them! !